Well, I duly had my interview for the job working for the Western Isles Council last week – and I didn’t get it. It’s a disappointment, though unlike the Hebrides themselves, I can honestly say it’s not the end of the world – since there were enough complications to make me a bit ambivalent. It would, for example, have meant relocating yet again for a temporary job, it’s a very long away from my parents who are in their eighties, and then there’s the wind, rain and the endless winters to consider. I imagine it would be like living in an Ingmar Bergman movie. Plus I very much doubt there’s a Starbucks on the islands. And, as ever in these situations, I tend to feel that somewhere out there is something more exciting than the job I didn’t get. So – I’ve just turned 50, I’m unemployed, and we’re in the biggest recession and public spending squeeze for 70 years – the world, as Terry Pratchett would say, is my mollusc. How bad can it be? In the meantime, I’m free to indulge my three great passions (or the ones I’m prepared to discuss in public anyway – and I’ve always maintained, like PG Wodehouse’s Uncle Fred, that a more enlightened judge would have let me off with just a caution): namely, baking bread, listening to Wagner – and, of course, knitting ganseys. After last week’s herculean effort picking up the stitches for the sleeve, all I had to do next was get the pattern to fit. 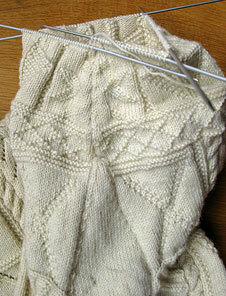 I wanted to use the same pattern elements as the body, so the gansey would look all of a piece. 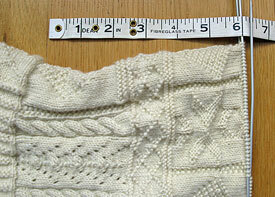 I’ve replicated the yoke pattern at the top of the sleeve (diamonds flanked with inverted yarn-over chevrons), with below that a narrow band of the diagonal trellis pattern as a border, while the rest of the sleeve will comprise the tree and starfish patterns all the way down to the cuff. Each pattern element is exactly the same as it was on the main body of the gansey (I know some patterns traditionally were knitted smaller on the sleeves, but I’ve decided to keep this one big and chunky). I’ve only made the sleeve “yoke” one panel row deep (the body yoke was 3 panels deep), because I reckon the main patterned part of the sleeve should end above the elbow – or at least I think it looks better that way. 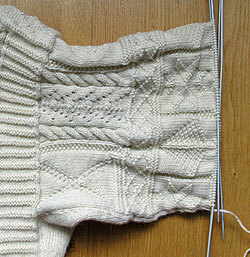 The gusset decrease was 2 stitches every fourth row, to match the previous rate of increase. Now that I’ve finished the gusset, I’ve switched to a rate of decrease of 2 stitches every 5 rows, so as not to run out of sleeve too soon. Sourdough is fun. A lot depends on the quality of the yeast you get, which is why some companies sell sourdough starter. I suspect that in a kitchen in which bread is baked frequently, there will be some good yeast floating around. It’s a pity about the Hebrides job but there are advantages to being on the mainland, wider yarn supply for one. I’d never heard that about some sleeve patterns being made smaller. The designs on yours are fine-textured as it is. The theory is that you will be baking a small amount daily. I eventually lost my starter when I didn’t bake often enough. The French stretch-and-fold, 90-degree-turn kneading method looks very much like what I did, only I didn’t throw it down onto the surface. Watching the video reminded me of a traditional 19th century method I read of called “beaten bread” where the dough would literally be beaten with a stick for an hour or so. I have no idea how it came out. I expect it came out whimpering, if it was beaten with a stick… The slapping down is a bit exaggerated in that video. I think, though I do find myself bringing it down with a fair old whap nevertheless. The hard part is stopping myself from adding lots of flour, since the dough starts off pretty wet, though with that technique it firms up nicely.